Rival to Alexa and Google Assistant will initially look to target smart homes and cars. IBM is launching a new voice-activated virtual assistant powered by its Watson AI platform. Unveiled at the company's IBM Think event in Las Vegas, Watson Assistant looks to further the deployment of voice interaction tools around the world. IBM is even making the tool freely available, meaning companies will be able to develop their own use cases for the technology - right down to the phrase needed to interact with the service. The company showed off an example of the new service in a Watson-powered hotel, which was able to automatically check in a guest while the room pre-loads their favourite music and temperature preference, as well as supplying a rental car before their arrival. 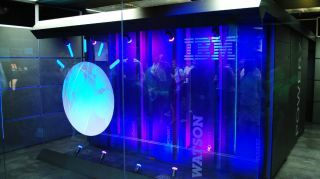 Watson Assistant utilises several existing IBM products for its intelligence, including Watson Conversation and Watson Virtual Agent, alongside IBM's existing APIs concerning language and conversation analytics. The service will be able to learn about a user's habits based on what questions they ask, using this knowledge to anticipate future queries and find answers quicker. The company has already secured a number of partners for inital tests of Watson Assistant, including teaming up with audio experts Harman on a Mserati concept car, and smart home firm Chameleon Technologies for a voice-powered smart meter.